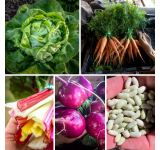 One of our most popular blog posts was on 5 new vegetables to try growing. We thought we would revisit this post and highlight some new and unique vegetables that you might want to try. Many of these vegetables are unique in color, which makes them great conversation pieces. Some people have even told us they use them as displays around their house. We have also highlighted places you can find the seeds or plants if you want to try growing now or in the near future. 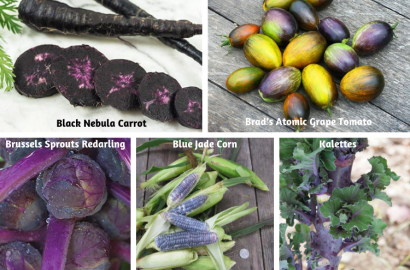 Black Nebula Carrot – This carrot is one of the darkest carrots available. It can be eaten raw or cooked. If you like to juice your carrot, you will find the juice is purple. If you add lemon to it, the juice will turn bright pink. If you cook the carrot, it will retain its color. While black carrots might seem new to you they were actually found in the Middle and the Far East long before orange and yellow carrots were cultivated. You can also leave the carrots in the garden and use them for cut flowers. The white umbels are tinged with lavender on the edges and flower stems. Bees love carrot flowers so they make great food for pollinators. You can purchase seeds here. Brad’s Atomic Grape Tomato – These large sized grape tomatoes are multi-colored and during growth phases, the colors change. The exterior of the tomato starts out with lavender and purple stripes, turning to green, and then red/brown with blue stripes when fully ripe. The interior of the tomato is green that turns red when extra ripe. They are sweet tasting and are great in a salad or just eaten on their own. Reviews of the plant indicate that it does well both in-ground or in containers and is easy to grow. Seeds for this plant are available here. Brussels Sprouts Redarling – This new Brussels sprout has a unique, bright purple-red color and grows to be 1-inch. This vegetable has a slightly sweeter taste when compared to the green variety and are a source of Vitamin C and folic acid. The plant grows 30 to 40 inches in height and 20 to 30 inches wide. The plant stands up to cool nights and frost. If you are a real foodie, this could be the vegetable for you. These Brussels sprouts are available from Burpee; are mild in flavor and will be popular at the dinner table. Try growing this Burpee product now. Blue Jade Corn – We don’t know if you’ll like the tastes but we love the color of this corn plant. This corn is sweet tasting and is a dwarf variety, which makes it great to grow in containers. The plant grows 3 feet and each stalk will produce 2 to 3 ears. The steel blue kernels are plump and moist. Prepare and cook shortly after picking — flavor is lost quickly! When cooked the ears turn jade blue. Blue Jade Corn will thrive in hardiness zones 3 and above, and its average growing period of 70 to 80 days makes it ideal for all but the shortest growing seasons. Blue Jade Corn seeds are available here. Kalettes – This vegetable is a cross between kale and Brussels sprouts. They are also found under the name “flower sprouts” or “brusselkale”. They have been available in the UK for many years but only available in the US for a few years. Johnny Selected Seeds has several varieties to choose from depending on maturing time periods. The plant is a highly nutritious vegetable and can be eaten raw or cooked. They are mild flavor and can be steamed or sautéed. Similar to Brussels sprouts, the plants form tall stalks but actually remain open. The plant forms bi-color florets that are 2-inch in diameter and take time to reach maturity; thus require some patience. The plant is not as hardy as kale or Brussels sprouts. Plant seeds are available here. Let us know if you give any of these a try!